Dramatic changes are on the horizon for the rotor world in China. Current trends are shifting and recent forecast predict a significant boost for helicopter production, maintenance and construction in China. Increasing demand for more helicopters both in the public & private sector, air spaces opening gradually, implantation of major international aircraft constructors in China, boost in tourism, leasing companies rising need for helicopters, taking passengers to remote places without runways. With current forecasts predicting a sharp increase in helicopter demand, as well as China’s increasing prominence on the world rotor stage, 2019 China Helicopter Exposition is an unmissable event for rotor aircraft professionals globally. 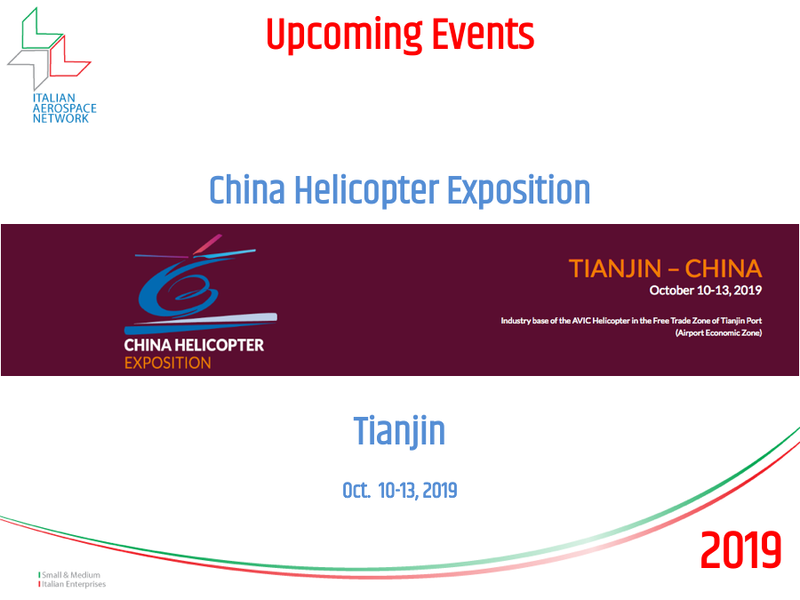 Italian Aerospace Network (IAN) represents Italian companies interested in taking part to 2019 China Helicopter Exposition, inside a 60 sqm pavilion that is going to welcome max. 6 Italian companies (10 sqm. each), conveniently and strategically positioned in Hall 1, Booth 1D601. A warm welcome to participate to this Event. If you are interested about this event please full fill the following form to get more info about it.